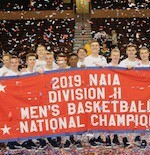 Exactly 227 days after they last walked off the court - finishing just six points shy of advancing to the Elite Eight in the NAIA-II national tournament - the Oklahoma Wesleyan University Eagles men's basketball team swooped back into action Monday night. Surviving a scorching challenge by St. Thomas (Texas), of Houston, the Eagles captured a 107-104 win in overtime. OKWU bolted to a 51-38 halftime lead - only to see the Celts storm back to tie the game, 93-93, by the end of regulation. OKWU then put up 16 points in the extra period to open the season with a chest-thumping triumph against a high quality foe on its homecourt. Last week, OKWU was voted as the preseason favorite to win the Kansas Collegiate Athletic Conference crown. The St. Thomas Celts carved out a 16-12 record last season but didn't qualify for the NAIA-II tourney. 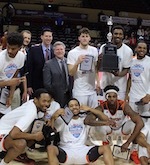 Their roster includes four seniors - 6-foot-4 guard Peter Ellwanger (6'4''-G), 5-foot-11 guard Sam Flores (6'0''-PG), 6-foot-1 guard Paris Marquez and 6-foot-2 forward Orowo Eleyae. But, the Celts returned their top two scorers from last year - Eleyae (13.4 ppg) and Marquez (13.2 ppg). Also back is Kennard Robinson, who pumped in 11.2 ppg last season. Flores rounded out last year's top five scorers (8.9 ppg) for the Celts. Another potent big man back for St. Thomas is 6-foot-6 forward Nathan Thormaehlen, who led the team in rebounding (5.2 rpg) and blocked 20 shots in 27 games. Thormaehlen pumped in 15 points, but grabbed only two rebounds, for St. Thomas in the loss. OKWU's offense sizzled, hitting almost 50 percent of its shots (34-of-69), including 16 three-pointers. The Eagles blistered the nets on free throw shooting (23-of-26), and outrebounded St. Thomas, 43-37. Based on the most recent interview with OKWU head Donnie Bostwick - who last year guided the Eagles to a 26-9 record - OKWU might boast even more experience and production. Five starters from last season - although some of their roles might be modified this season - return, including Josh Wilchombe (13.2 ppg, 10.5 rpg), K.J. Malveau (15.2 ppg, 3.0 rpg), Issak Rowe (12.3 ppg, 7.9 rpg), Jake Feickert (8.6 ppg, 2.8 rpg) and Elbert Lawrence (6'1''-G) (8.5 ppg, 2.2 rpg). Combined, this feisty fivesome averaged 57.8 points and 26.4 rebounds per game. That's a lot of firepower and muscle under the boards back in the Eagles' fold. Lawrence dropped in two crucial free throws in overtime to help secure the Eagles' win. Earlier in the period, Rowe buried a jumper that began the final push for the Eagles' win. In addition to some other key players from last season, some who include Arman Akbar, Janson Lietkze, Chris Murphy and Curk Harris - all of who appeared in at least 19 games - Bostwick also brought in some notable newcomers. One of them is former Muskogee High School hardwood hero Brooks Haddock, who might have a big impact his freshman year at OKWU. Lance Tipton (6'6''-F) - a heralded transfer from Southwestern Assemblies of God (SAGU) and former Freshman of the Year (2016-17) in the Sooner Athletic Conference - and freshman Brandon Bird also have potential to make sizable contributions in their first campaign in an OKWU uniform. Tipton averaged 10.6 points and 4.5 rebounds per game last season for SAGU. During his freshman campaign (2016-17) - during Bostwick's final year as SAGU head coach - Tipton pumped in 9.5 ppg and grabbed 4.0 rpg. Tonight's OKWU vs. St. Thomas showdown could potentially be a matchup between two teams ranked in the first NAIA-II national preseason poll, due out later this week. OKWU's schedule hardly gets easier in the early going. On Friday, the Eagles will play host at 8 p.m. to Kansas Christian College. Saturday will feature the OKWU Alumni Game, set for 7 p.m. On Nov. 1, the Eagles face perhaps their biggest non-conference challenge when College of the Ozarks visits the Mueller Sports Center. Tip-off is set for 7 p.m. OKWU jumps into KCAC play with a road game Nov. 14 at McPherson (Kan.) College.